SENTENCED TO DISSECTION - BETWEEN THE WORLDS AVAILABLE NOW! Sensational demolishing opus from Russian Tech Death outfit Sentenced To Dissection is finally will be released physically with merchandise and bonus songs. Merciless brutal riffage, crushing drum passages and killer vomitations for all fans of Beneath The Massacre, Spawn Of Possession and Origin. Available on regular jewel-case CD and as limited to 100 hand-numbered copies digipack edition. Do not miss this amazing album! LETHALITY - PROMO 2018 AVAILABLE NOW! Brand new 4-song promo from Ural based blasting whirlwind Lethality is a presentation of a new face of the band and the fragment of forthcoming full-length monument which will be out in 2019. Strictly limited to 300 copies worldwide, factory pressed CD in cardsleeve! 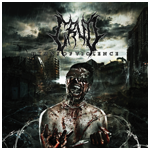 CRUD - HYMNS OF VIOLENCE AVAILABLE NOW! Crushing debut full-length from Russian maelstrom is full of smashing brutal structures, tragic tremolos and uncompromising slam inserts for all fans of Vomit The Soul, Stabwound and Severed Savior. Do not miss this amazing CD! 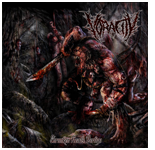 VORACITY - SHRUNKEN HEADS VERTIGO AVAILABLE NOW! Debut full-length album from Ukrainian slam squad Voracity is nothing but a raging chaotic sickness ready to proliferate! Uncompromising blood-soaked riffage, ruthless drumming and deep guttural vocals. This piece of sonic brilliance will be released in 2 versions: regular CD version and limited to 100 hand-numbered copies alternate version with different design. Cover art by the almighty Matthias Auer! 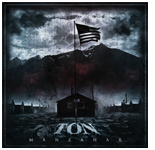 TON - MANZANAR AVAILABLE NOW! Brand new single from Ohio death metal masters! New step in the bands history. Best and most intense material to the date. CD limited to 100 hand-numbered copies, a must have for all fans of quality death metal music. Do not miss your copy! Debut 3-track EP from Impulsive Gluttony is a raw, filthy guttural slam for all fans of Cerebral Incubation, Artery Eruption and Digested Flesh! All music solely composed, recorded and mixed by Alex (Egregious, Bowel Leakage). Enlightenment Through Narcotic Dissolution will be limited to 500 hand-numbered copies. Ltd.50 Demo 2012 free with 25 first pre-orders of any CD+merch package. Do not miss yours!!! WEAKNESS - DEMOLITION AVAILABLE NOW! Uncompromising slamming butchery from Siberia for all fans of early works of Devourment, Cephalotripsy and Infernal Revulsion. Demo 2009 plus two rare unreleased old tracks as bonus. Limited to 500 hand-numbered copies. Do not miss this sickness! GURGLECTOMY - SEAS OF ROTTING VOMIT AVAILABLE NOW! Re-issue of well-known sick EP from Argentinian blasting guttural death monsters Gurglectomy. New get-up and one killer unreleased bonus track! The last chance to get this amazing release into your collection. Limited to 500 hand-numbered copies! BOWEL LEAKAGE - HARVEST OF NAUSEATING REMNANTS SOLD OUT! Bowel Leakage hailing from Moscow will exterminate humanity with this EP. 6 tracks of blasting goregrind with guest vomitations from NX5 (Active Stenosis) and Erwin De Groot (Last Days Of Humanity, S.M.E.S.). Limited to 100 hand-numbered copies! GORGED BILE - ORIGIN OF CONTEMPT AVAILABLE NOW! Merciless Moscow brutality is back with their brand new album. Sick guitars and bass passages, uncompromising drum patterns, killer vocals... 10 tracks of slashing structures with more hate than first time! You have been warned! SATURNO - Thou Art All AVAILABLE NOW! Ungodly Ruins Productions proudly presents Saturno! Atmospheric death metal tornado from Italy with some tech delights, bewitching melodies, conceptual lyrics and killer vocals. Do not miss this amazing CD! BAALSEBUB - THE SICKNESS OF THE HOLY INQUISITION AVAILABLE NOW! Ungodly Ruins Productions extremely presents the long awaited debut full-length CD from Estonian medieval brutal execution Baalsebub. Eight tracks of crushing blasting style with some smashing slam inserts, killer riffs and sick vocals. Amazing cover art by Alex Tartsus Studio. Do not miss your copy of this masterpiece. SLAVES OF SUFFERING - ADVENT OF DESPAIR AVAILABLE NOW!